It was Mr B’s birthday this week and as he hadn’t really asked for anything in particular I decided that a birthday bake would be a lovely surprise for when he got home from work. We are both massive foodies and complement each other really well in the kitchen – his cooking skills are far superior to mine and he regularly produces the most delicious dinners for us. Baking is, of course, more my forte and my skills in this area are, I think, one of the main reasons he married me! Instead of baking a traditional birthday cake this year, I decided to reproduce one of his favourite sweet snacks – Jaffa Cakes, something which he can quite easily demolish a box of if given the chance. I love the idea of trying to recreate a homemade version of a shop-bought snack as I know that the end result is ultimately going to be better as there won’t be any artificial flavourings or preservatives in it so it will be so much more tasty. By pure chance I didn’t even have to search for a recipe, as one of my favourite foodie bloggers Jo from Every Nook and Cranny just happened to share her recipe for Jaffa Cakes on her Facebook page in the week running up to hubby’s birthday. 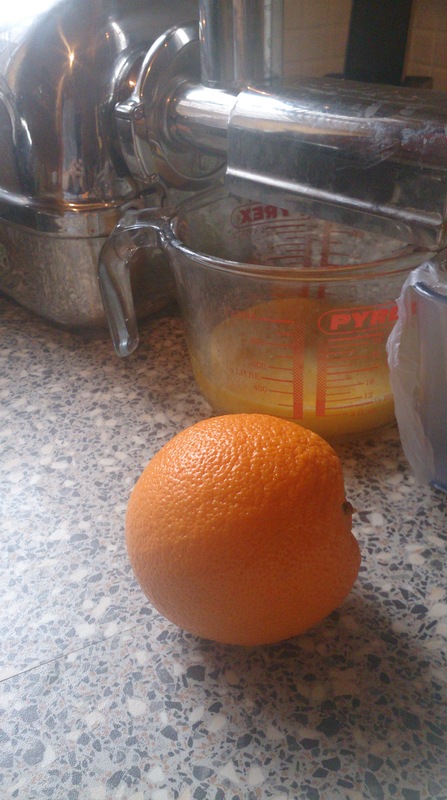 With my baking I always try to use the best ingredients and it was definitely worth the extra money I spent on buying the best oranges I could find (in this case from Waitrose) as the jelly was made from the pure juice, freshly squeezed from these delicious fruits. We are lucky at home that we have a masticating juicer and so I was able to extract a lot of juice from each orange and only needed to use 2 as they were very juicy but even if you don’t have a juicer, a traditional hand press squeezer (the metal kind most of us have in the kitchen) is perfectly fine but might mean you end up using a few more oranges than I did. 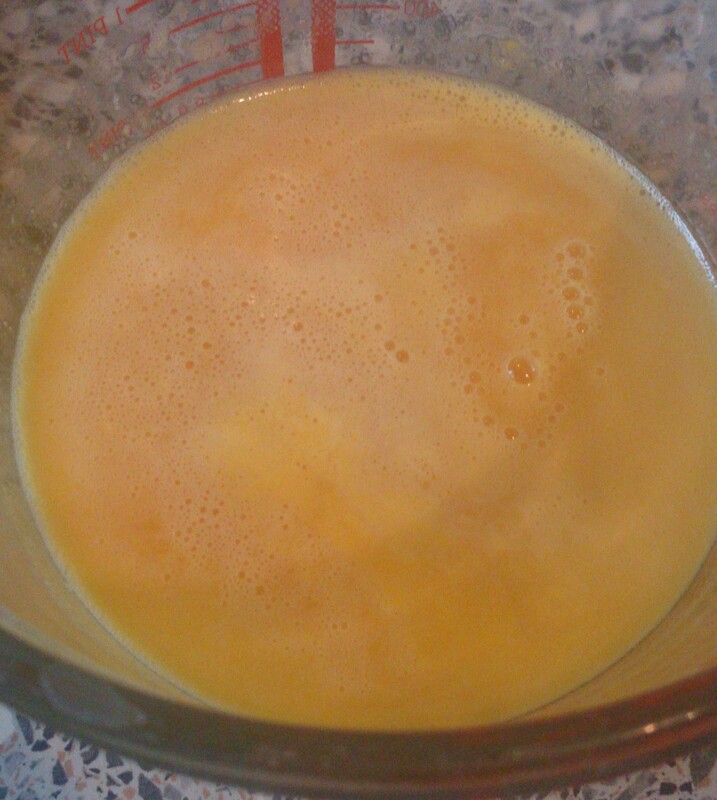 I certainly wouldn’t suggest cheating and using pre-squeezed juice as the fresh produces a really rich flavour which is definitely worth the effort. I had thought that it might be a little bit fiddly to create these delicious snacks but actually it was surprisingly easy albeit a little time consuming as the three distinct steps – making the jelly, baking the sponge bases and covering these in melted chocolate each took a little bit of time and required some patience as the sponges needed to be cool and the chocolate not too hot before it could over the jelly. As recommended by Jo I chose to use a ‘whoopie pie’ pan to make the sponges as it created a flatter bake. I found a mould fairly cheaply on Amazon as I didn’t already have one and would say it is really worth investing in if you plan to make these again (which I certainly will) as you wouldn’t get the correct shaped bases otherwise. 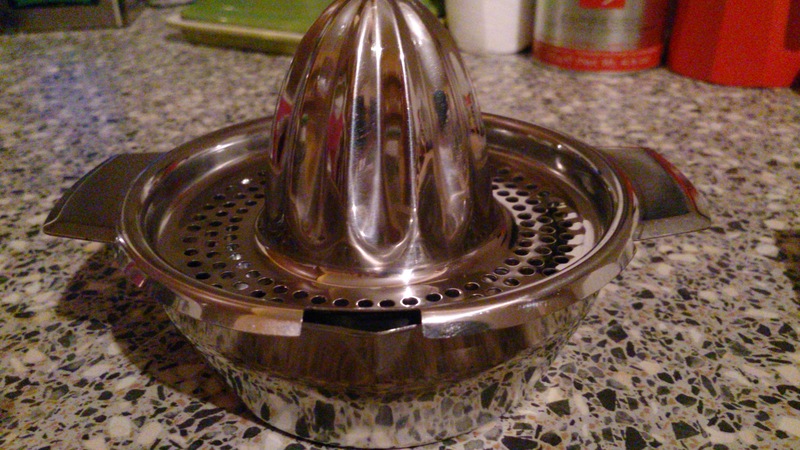 I will, however, share my handy tip for finding a cutter that is small enough for the jelly discs that sit on top, if like me you don’t have one – use a lid from an empty spice jar, it was the perfect size. Perfect golden discs – and only 8 minutes to cook them! Once all the steps are prepared – jelly set, sponges cooled and chocolate melted, the fun really begins as the Jaffa Cakes finally come to life as these separate parts are combined. I approached this final step with trepidation as I wanted them to turn out perfect however it was much easier than I expected thankfully. 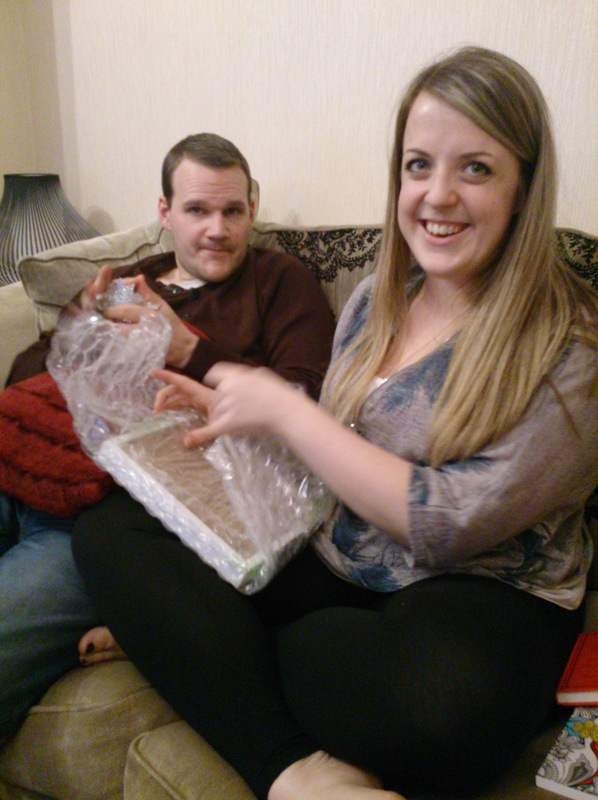 I finished them about an hour before Mr B came home from work which was just enough time for the chocolate to set. I am so pleased with the results and can happily report that Mr B loved them too and they are almost all gone only a day later! If you haven’t already checked out Jo’s blog I thoroughly recommend it – I regularly head there for baking inspiration for and am never disappointed. As well as sharing recipes for sweet treats she also has some delicious savoury recipes if that is more your thing so grab a cup of something warm and get yourself over there to see what you can find. As I am sure most bloggers do, every week I spend a large proportion of my spare time browsing social media and visiting others people’s blogs. I have learnt over the last six months that the blogging community is a friendly and welcoming place and have found that this browsing habit brings with it both inspiration and affirmation in equal measure. One such affirmation this week has been the overwhelming need to slow down and enjoy life. In a recent post the lovely Lucy Heath at Capture by Lucy reflected on the idea of ‘slow living’ and a new pace of life which has offered moments of calmness in a busy schedule and lots of extra happiness. Alongside this some random Facebook browsing unearthed a HuffPost article by Rachel Macy Stafford entitled ‘The Day I Stopped Saying ‘Hurry Up’. This retold the moment the author was inspired by her thoughtful, observant child to slow down so that she could enjoy life more. These pieces mirrored a feeling that has also developed in me over the last few years, where life events have taught me that I need to slow down, live life more positively and appreciate the everyday moments which bring me happiness. After a busy couple of weeks and the feeling I might be coming down with a cold, a few days living life in the slow lane were exactly what was needed this weekend and so some sourdough bread making was on the cards. Baking sourdough is most definitely a bread experience which requires patience but is certainly worth the wait, as the loaf produced has a flavour of its very own which, with every bite, makes you feel like you are eating the ‘real’ thing and makes you realise the lack of any flavour found in commercially produced loaves. How inviting does this loaf look? My love affair with this distinctively flavoured delight came about as a result of Mr B’s weekend routine of rushing to our local supermarket to get one of their few loaves and often returning disappointed. I therefore decided that for his last birthday I would give him a sourdough starter (purchased from Hobbs House Bakery online). This to most would probably seem like a fairly odd gift to give to their husbands but not for Mr B, he was delighted to receive it and couldn’t wait for the first loaf to be produced. It has been almost a year since then and during this time I have made a loaf most months and through this routine have learnt a lot about this artisan form of bread making. The magic of a sourdough loaf is that it is produced with only four simple ingredients – a starter, flour, water and salt. It is the starter which is the star ingredient, the simple addition of warmth to a flour and water mixture encourages the production of natural yeasts (which give the loaf its rise) and bacteria (which give the loaf its distinctive flavour). The dough rises slowly when using a starter as opposed to the ‘fast acting’ dried yeast used in most loaves, however it is worth the wait. In total the production of a loaf, from feeding the starter to taking the first bite of a freshly baked loaf, is around 24 hours. This may sound like an arduous amount of time, however the involvement of the baker in this time period is less than an hour as their only task is to produce the dough. 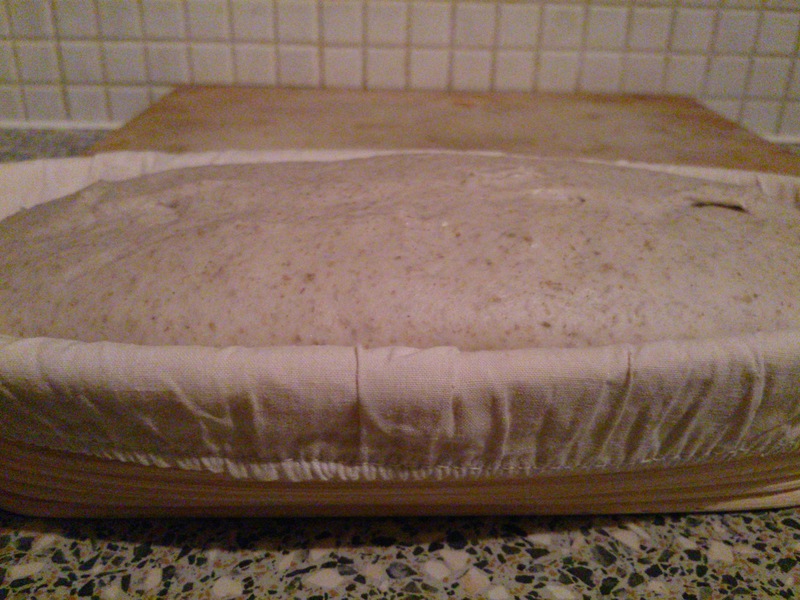 Prior to this the starter has been fed with some additional flour and water to reinvigorate it after its incubation in the fridge (where it lives between loaves) and then it rises slowly for up to twelve hours before being baked. It has been my mission over the last year to produce a perfect loaf and finally this weekend I think I may have finally achieved this (or certainly got the closest I ever have). 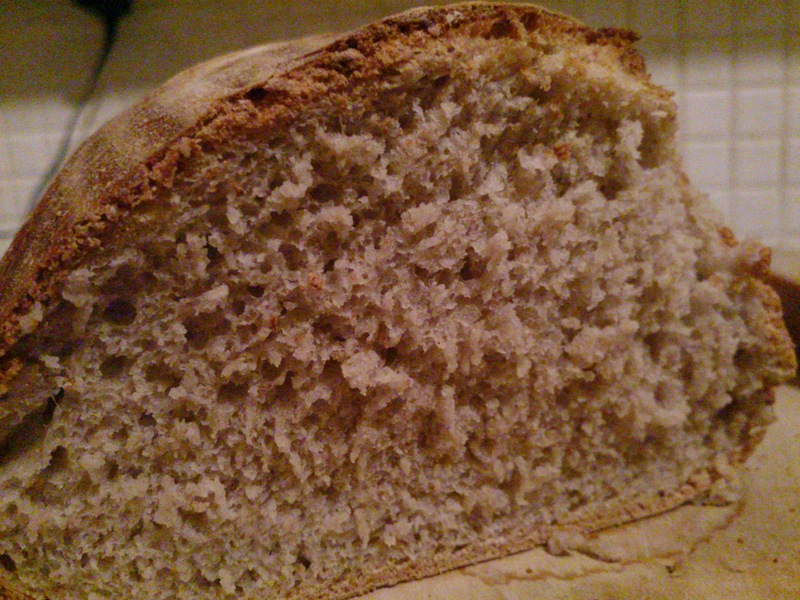 Over the months I have been making sourdough bread I have tweaked the original recipe and adapted the technique through trial and error (as well as some well-founded research). This seems to have all paid off as the loaf which emerged from the oven on Saturday evening could only be described as ‘stupendous’, a golden delight whose crust was a crispy coat surrounding the precious flavoursome loaf inside. 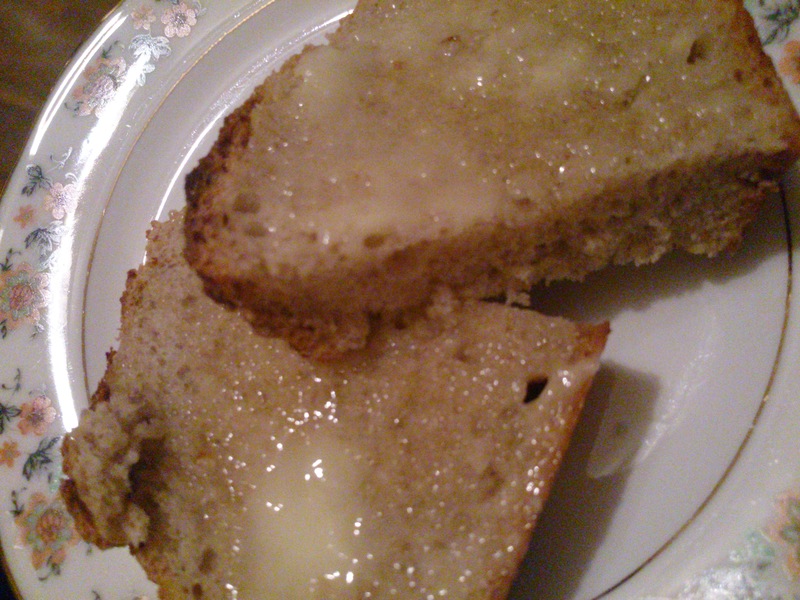 Spread with butter whilst still slightly warm it was heaven on a plate and soon between Mr B and I almost half the loaf had disappeared. 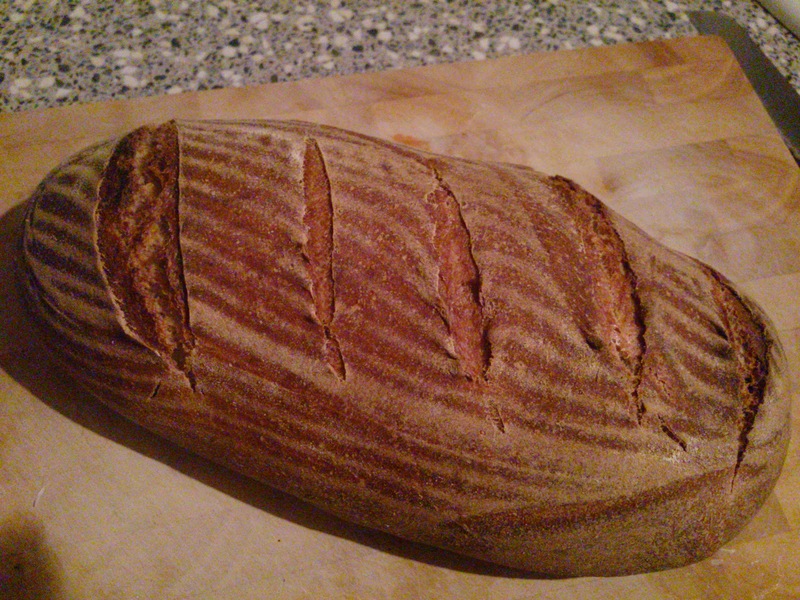 I’d recommend to anyone who has not tasted sourdough to give it a try, at first it’s tangy flavour is a little overwhelming but once the taste buds have adjusted it is such a delightful loaf which leaves others in its wake. If you’re interested in attempting to bake your own, I’d definitely encourage you and to give you a helping hand I would love to share with you what I have learnt in my journey to a perfect loaf. 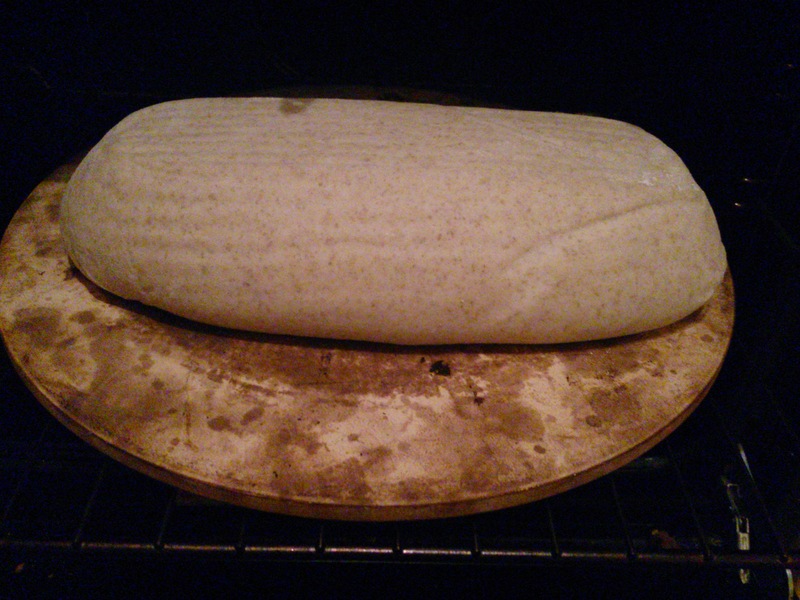 Starter – although it is fairly simple and very economical to produce your own sourdough starter (see instructions here), I chose to buy an established starter from a baker. My reasons for this were that it would be more active and resilient, guaranteeing a reliable and flavoursome loaf from the outset. Balancing the flour and starter ratios – I have tweaked the ratio between these two ingredients in order to create a loaf with the amount of tanginess which both Mr B and I enjoy. For the scientists in you this can also be influenced by the temperature at which the starter is fed as well as the liquid/flour balance of the original starter so I’d encourage you to give these a little tweak too and see what happens. Time the loaf is left to rise – my recipe states that the dough should be left to rise for twelve hours, however after several loaves and a little research I soon realised this was too long as it was over-proving and each time the loaf came out of the oven a large gap would be present between the crust and the inner crumb at the top. 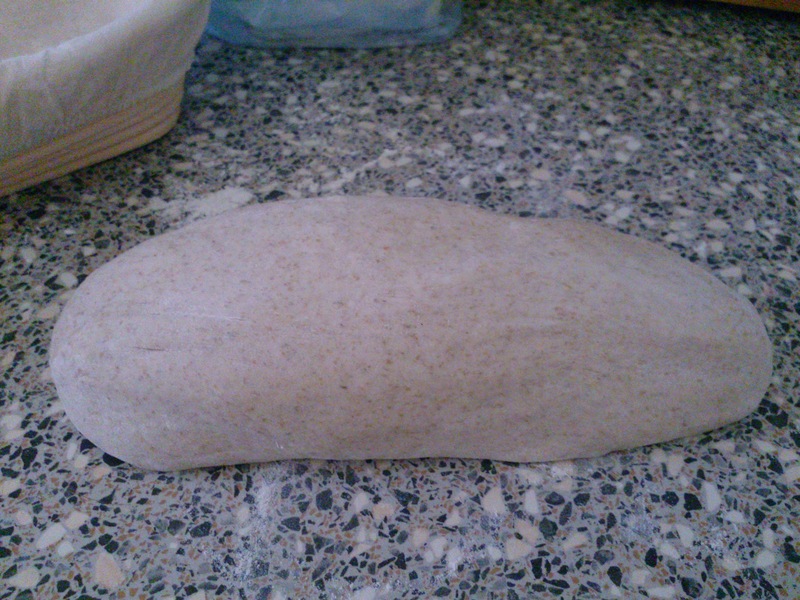 I have since left the loaves for around eight hours or until they have approximately doubled in size. The length of this time can vary depending on the temperature in the room but please don’t be tempted to put it in the airing cupboard as the slow rise is also key in developing the distinctive flavour. Using a proving basket and baking stone – the benefits of using these two items is that the loaves have a wonderful shape which they take on in the proving stage whilst sitting in the basket and a wonderful crisp golden crust which comes from the brick oven type effect the heated stone gives. Temperature change in the oven – a recent discovery has been the need to reduce the temperature by 20-30C after the first ten minutes of baking. This emulates the effect of a brick oven which naturally drops in temperature during the baking time and produces the distinctive crisp crust without ending up with a over-baked loaf (as the initial temperature is usually the highest your oven will go). Steam in the oven – another secret to producing a great crust is the addition of steam at the beginning of the baking time – I achieve this by adding some boiling water to a roasting tin in the bottom of the oven just before I put the unbaked loaf on the baking stone. Good luck with your sourdough adventures, I’d love to hear about your successes and any tips you have for creating your perfect loaf as I am sure there is still more for me to learn. I am so excited to share with you today an amazing day I had last Friday in the company of the very talented Katie Essam and my lovely friend Lucy Bishop (of Mrs Bishops Bakes and Banter blog). 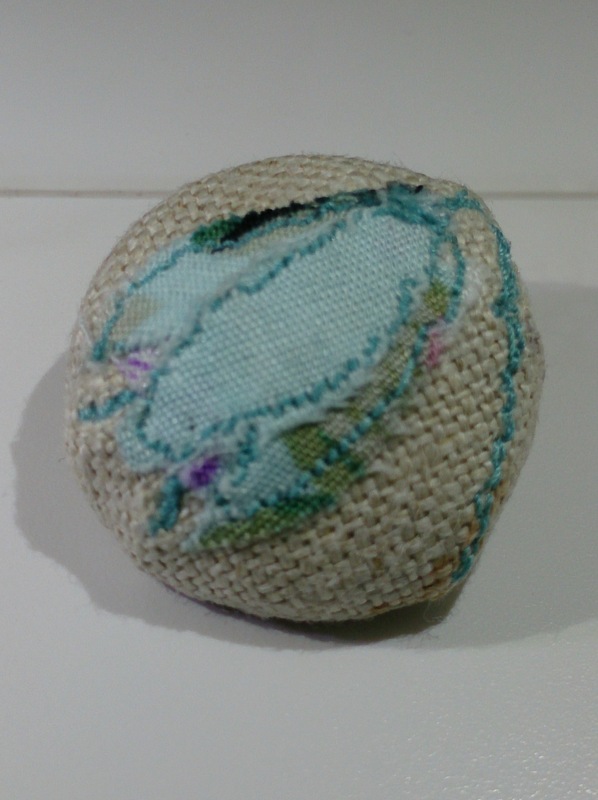 As most of you are aware I love to learn and am always seeking ways to improve my craft skills, so when Lucy and I met the lovely textile artist Katie Essam, at the Handmade Fair last September, I was super excited to hear that she ran workshops and jumped at the chance to go on one. Her work is amazing, combining a multitude of materials including paint, wool and paper as well as the more conventional fabric that is usually seen in free motion work. I just knew a workshop with Katie would be an wonderful experience and a great learning opportunity. Luckily for Lucy and I, Katie is based just up the road from us, in Watford, so on Friday morning we headed the short distance up the M1 excited for what lay ahead. Upon arrival the super friendly Katie welcomed us into her lovely home and we quickly settled in her studio to practice some sketching with the machine. 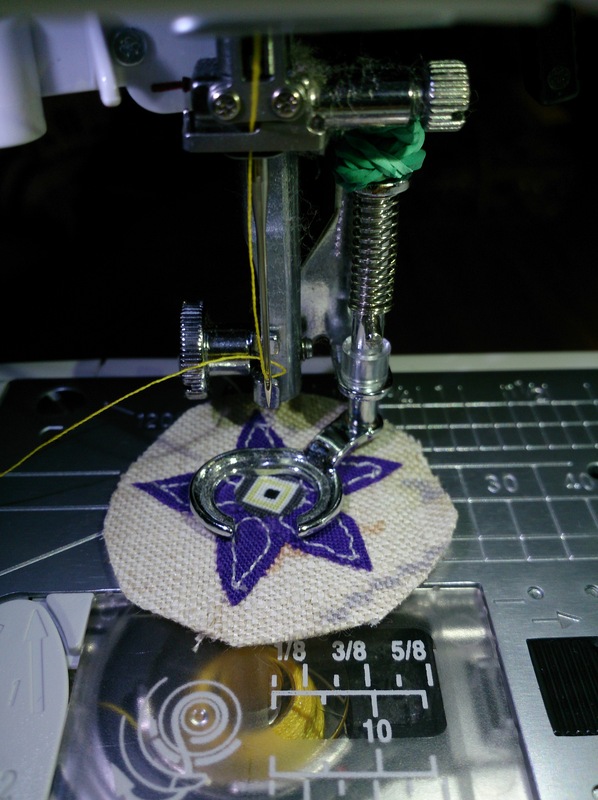 The freedom that lowering the feed dogs and attaching an embroidery foot offers is so satisfying, it turns the needle into a drawing implement allowing a line to be drawn in whichever direction you fancy (a rather disconcerting experience at first but awesome once you get the hang of it). Having done some free motion work previously I took this opportunity to practice creating a blackwork style picture , using an adult colouring card as inspiration for this. We soon moved onto making decisions about our final piece, which we would be working on for the rest of the day. I decided to focus on animals as my inspiration as I was keen to include some of the needle felting that I had seen in Katie’s work and she had recommended something furry if that was the case. During the week I had spent a couple of evenings sketching British wildlife and on the day, with Katie’s expert opinion to help me, I settled on a pair of leaping hares as the focus for my final piece. Now the fun really began as we were let in on the secrets behind Katie’s amazing work and encouraged to apply them to our own pieces. 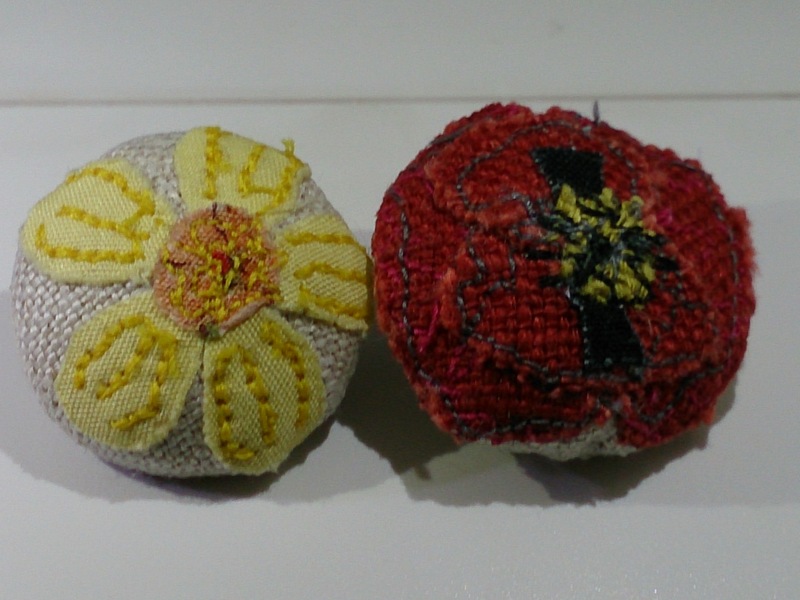 What a great time both Lucy and I had playing with fabric and transforming our designs into wonderful pieces of art. Katie was such an amazing teacher, she had prepared examples of her techniques for us to refer to as well as a handout to take home (in both a written and visual format – thank goodness as I am such a visual learner with this sort of thing!). She was also really patient and encouraging throughout the day as well as being a generally lovely person and a mean jacket potato chef (which we had for lunch to fuel our activities). 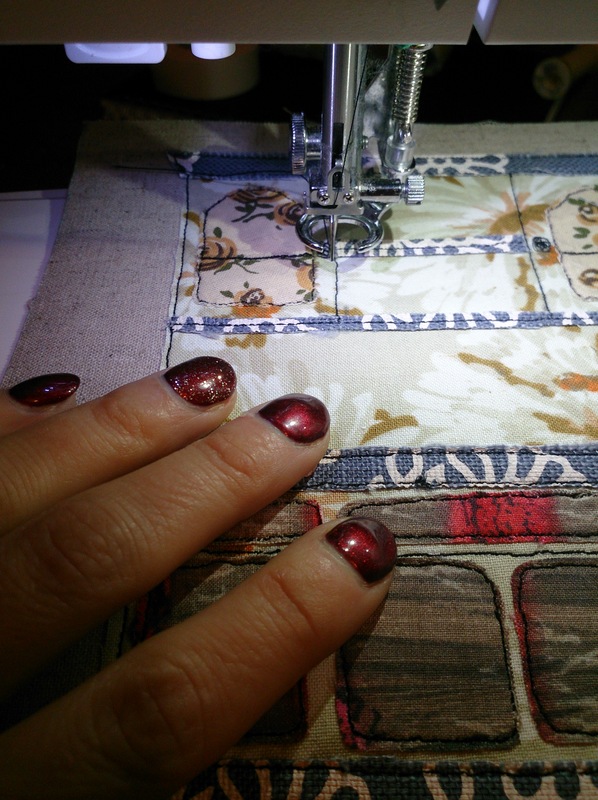 I loved having the opportunity to learn from such a talented artist and although I had been on a free motion course previously I gained a host of new skills from Katie as well as being offered some handy tips to help me improve my overall sewing skills when creating pieces at home. It was also lovely to see my super crafty friend Lucy learning a new skill whilst creating a beautiful and unsurprisingly biscuit/cake themed piece. We both ended the day hand finishing our pieces in our own individual style, with my hares getting fluffy tummies, tails and hind quarters using some wool fibers and a few stitches as well as a touch of pink paint in their ears. These final touches, accompanied by the techniques Katie had taught us, really brought the pieces to life and I know both Lucy and I were both super proud of our completed work and can’t thank Katie enough for sharing her knowledge and skills with us. 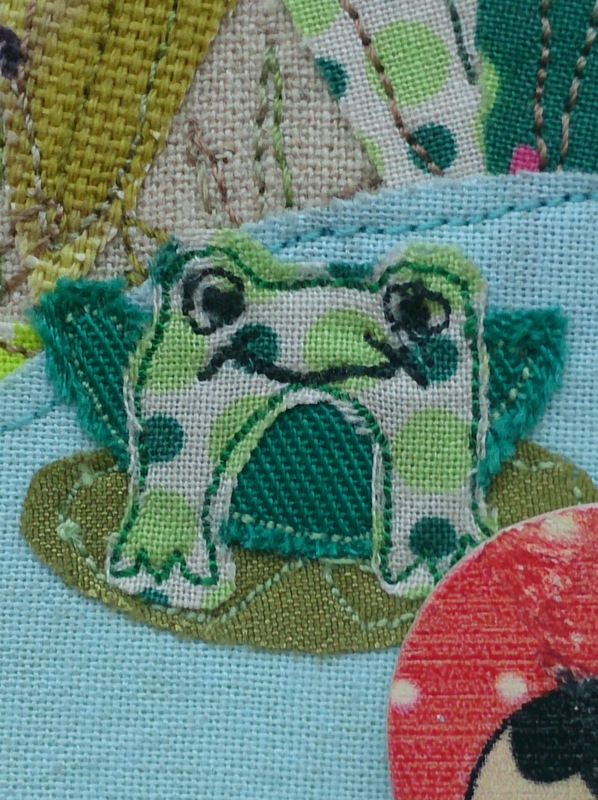 I definitely urge anyone who wants to learn free motion embroidery to book onto a course with Katie (even if you are less local than we were – it’s worth travelling for). Her workshops are tailor-made to your level of skill and she is such a lovely person who throughout the day is on hand for help, encouragement and inspiration. If you want to know more visit her website here. I can’t wait to start my next free motion piece at home, the day has taught me so much and is really going to have a massive impact on the quality of my work going forward. Keep your eyes peeled on my social media platforms over the next month or so as I will be sharing my progress as I create my first collection of pieces to sell – so exciting!! I’m not really the type of person to make new year resolutions as I think that anytime is a good time to make a change in your life for the better. However, I do view the new year as an exciting time of anticipation, wondering what the year ahead will hold and if my ongoing dreams and ambitions will be fulfilled. 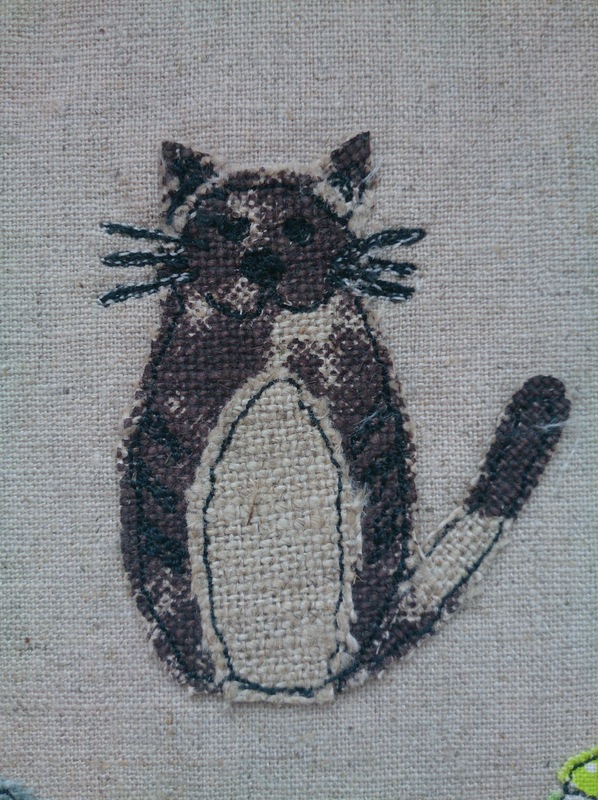 This new year I am excited at the prospect of making my hobby into something more (and in turn hopefully fulfilling a long held ambition) as I look forward to creating some freehand machine embroidery pieces and offering a few for sale in a lovely local bookshop. I can’t wait to take this first step in creating a little business for myself and am so excited to be collaborating with another local businesswoman (can’t wait to tell you more in an upcoming post). For me this new year is a perfect time for this journey to begin as in the few weeks prior to the Christmas festivities I was in a stitching frenzy, creating some super secret gifts for my family and friends. Sadly, due to the top secret nature of these items a blogging drought was imposed upon me and the only indication that I had not disappeared entirely was a few sneak peaks of some of the makes on Instagram. The inspiration for all of my Christmas gift makes was a lovely collection of buttons that I picked up when I visited the Handmade Fair back in September. Each of these was intended to represent an interest or hobby of the recipient or to reflect their style and home life. They included a pair of miniature scissors for a fellow crafter friend, a collection of cat buttons for the feline fans in my life and a little hedgehog for my green-fingered father. I always find that my creative juices flow better when I have a great starting point and these buttons were a perfect example of this being the case with each one inspiring a collection of designs. This paired with my wonderful fabric collection, which also happily grew in the run up to Christmas due to a very bountiful fabric swap, meant that I was super excited to start making the designs into a reality. In a mad couple of weeks before Christmas every night and weekend was spent finalising designs, creating templates and choosing fabrics as well as the wonderful creation of the seven pieces destined for a place under my friends and families Christmas trees. I worked as usual to the wire (under pressure is always better isn’t it!?) finishing the final piece on the 23rd of December just before the madness of Christmas was due to begin. 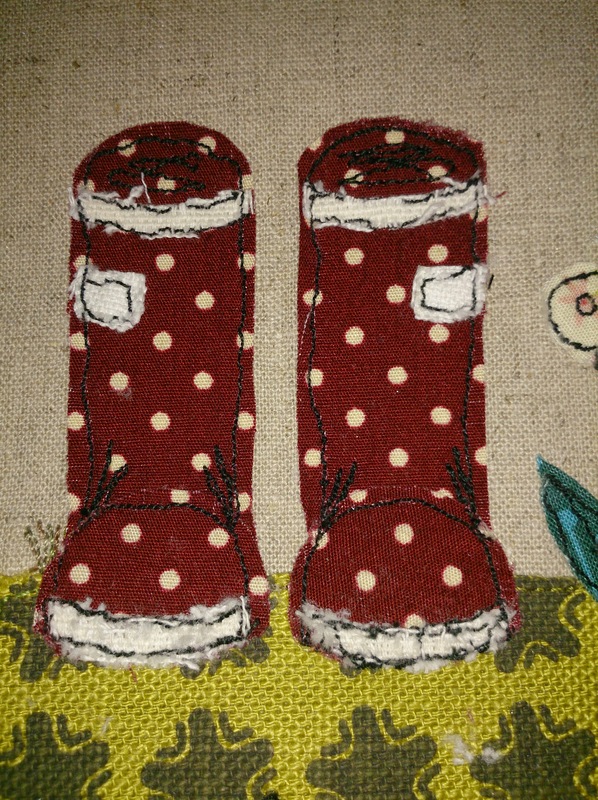 As well as creating a collection of pieces for the most important people in my life this intense period of creativity, across a diverse range of designs, really helped to build my skills in freehand machine embroidery which I think will be super helpful going forward. I feel like I am on a crafting journey every time I sit down to craft and am so excited about what the next few months will bring and the things I will learn. 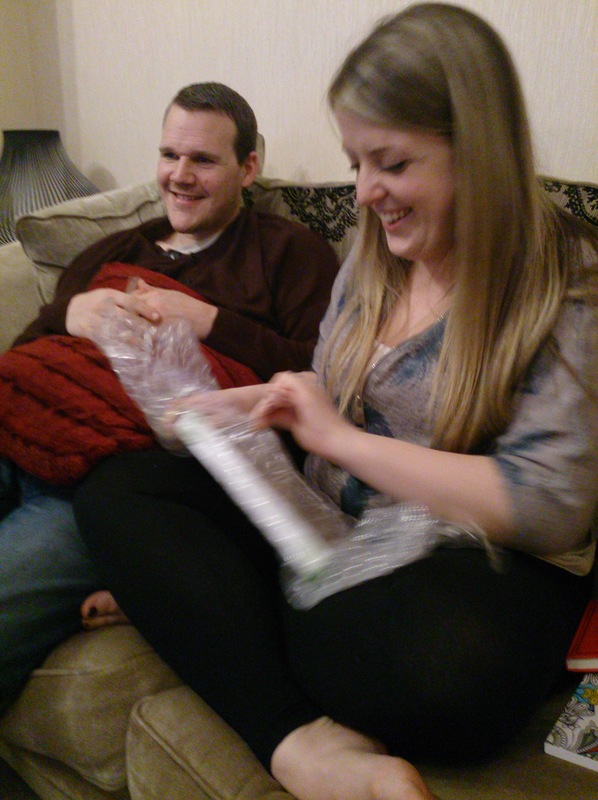 I’d like to finish with a picture of my sister receiving her gift, which was a representation of her adorable cats who my whole family have fallen in love with (including myself – Mrs Cat Allergy Central!). I think these pictures do not need any further explanation, they speak for themselves and are the reason I love making and creating. November seems to have whizzed by this year and it is only now that I am finally getting round to putting pen to paper (or should that be fingers to keys) and reporting in with the general bloggersphere. It has been a funny month, I have been struck down by lurgy for some of it and for the rest have been trying to catch up as well attempting to make a start to Christmas preparations. I have felt like I have been chasing my tail for the most part and even as December draws ever nearer Novembers list is still way off being completed. However, despite all this a bright beacon has shone in the form of the amazing #AutumnSurpriseProject. This is a lovely initiative organized by Lucy Heath through her wonderful blog and Instagram profile @capturebylucy. As soon as I heard about it I knew I had to take part as the idea of random acts of kindness is something which really appeals to me. I can think of nothing better than increasing the amount of happiness and positivity in the world. The collective impact of this project, which has been repeated with the changing seasons, cannot be underestimated and Lucy should be very proud of what she has created. I could not wait to get started planning my surprise gift package to send to my project partner, a lovely London based teacher whose Instagram profile revealed a keen sense of style and a love to travel. In the fleeting spare moments I could grab this month I have thoroughly enjoyed selecting and creating items to send to my project partner which were in part inspired by her love of wildflowers, the colour grey and sausage dogs. 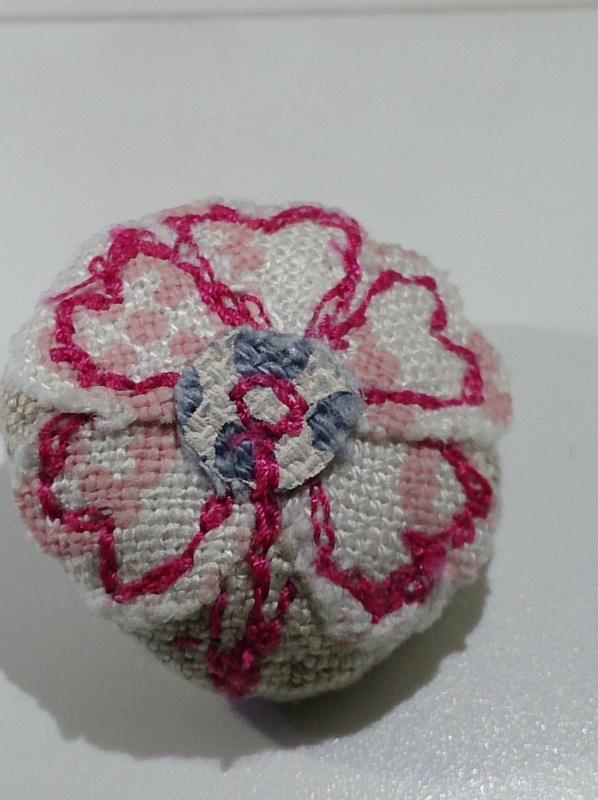 As you may expect I couldn’t resist adding a creative element to my package and used free motion embroidery to create a some wildflower inspired fabric covered buttons as well as a sausage dog themed mini-cushion. The buttons in particular were a challenge for me due to their miniature scale and the fact that I have never attempted flowers before. 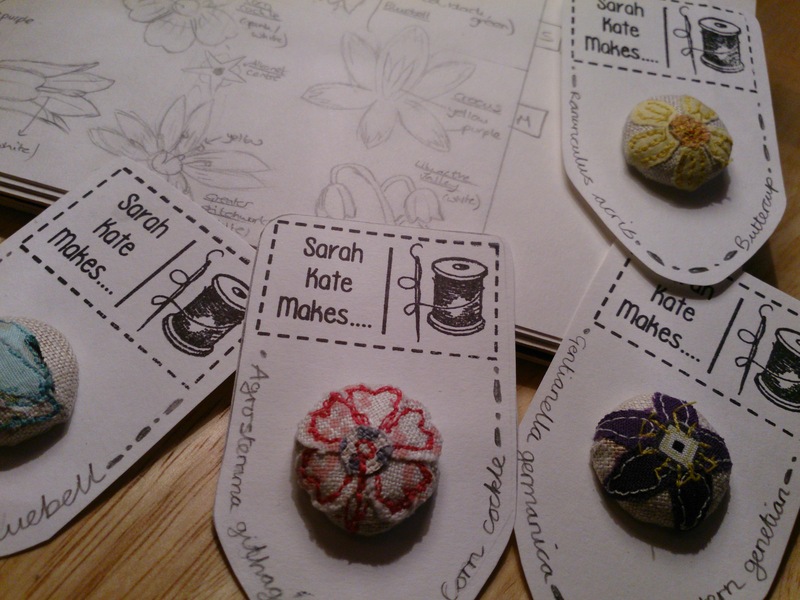 I’m quite chuffed with the result and especially enjoyed creating the personalized tags to present them on, giving me a chance to use my ‘sarah kate makes’ stamp bought for me by mum for my birthday in July. For my non-handmade gifts I added a lovely fragrant candle (another of my project partners loves) and an amazing ‘moodle’ book which I loved so much I had to buy one for myself too. The concept of a ‘moodle’ is a doodle with the power to change your mood and for me personally seems a much better option than the ever popular ‘colouring for mindfulness’ which unfortunately, due to my perfectionist tendencies, creates more frustration than calm. I, of course, chose the ‘happy’ themed ‘moodle’ book and can’t wait to fill it with positivity and hope my project partner enjoys her moodling moments too. The date for the exchange of gifts to be sent by was last Sunday, the 22nd November and I could not wait to see what my package contained and to send my package to my lovely project partner. Having picked up my package from the post office the day before it was with much anticipation and excitement that I opened the unassuming cardboard box to reveal a selection of beautifully wrapped gifts, each labelled with a Bali-themed tag, a holiday destination which was common to both me and my project partner. 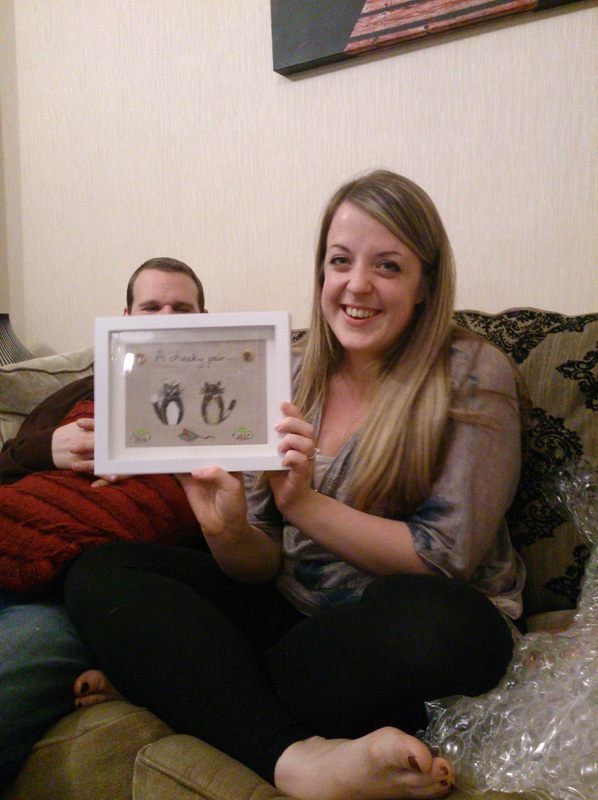 I cannot believe how amazing the gifts I received were, such thought had been put into selecting them, it felt as if they had been bought by someone who had known me for years. Each tag revealed the reason the gift had been included. The first was a handwritten recipe for a Balinese banana cake ‘because I love to bake’, next was some awesome fabric ‘because I like retro patterns’ and finally there were some cute ‘handmade with love’ buttons ‘because I like to make things for others’ as well as a gorgeous ribbon spindle ‘because sometimes things can look too pretty to use’ (a sentiment which I definitely agree with here). Opening these wonderful gifts definitely added a huge dollop of delight to an otherwise quite dreary dull day and I can’t thank Lucy Heath and my project partner enough for their combined efforts in creating this happiness. In a world where positivity and kindness to strangers can sometimes be hard to find, a simple act like this offers a glimmer of hope and as my project partner said when she received her package from me it can ‘restore our faith in human kindness’. There’s not been much delight to be had this week with the dreary wet and misty days we have been having and so when we were given a dozen or more apples from a work colleague of Mr B’s I decided to capture some of their sun ripened sweetness and create some delicious homemade treats. As apples are hubby’s absolute favourite choice of pudding ingredient the first recipe on the agenda was a homemade apple pie as requested by Mr B himself. For some reason I have been avoiding making pastry for as long as I can remember, as I have been under the illusion that it was uber-complicated and could easily go wrong. This fact probably wasn’t helped by my only previous foray into pastry making was puff pastry for apple turnovers which is a lot harder than the shortcrust needed for a traditional apple pie. As an avid baker, with most gadgets to hand when creating kitchen yumminess, I realised that my inexplicable aversion to pastry had gone so far as not even having pie tins and so a quick visit to TK-Maxx resulted in their purchase and sealed the deal for me in creating hubby’s request. My lovely friend Lucy recommended a fail-safe shortcrust pastry recipe from be-ro (to be found here) and good old Mary Berry provided the inspiration for the apple filling (from her glorious Baking Bible) and so with a spring in my step I felt I was set for success. 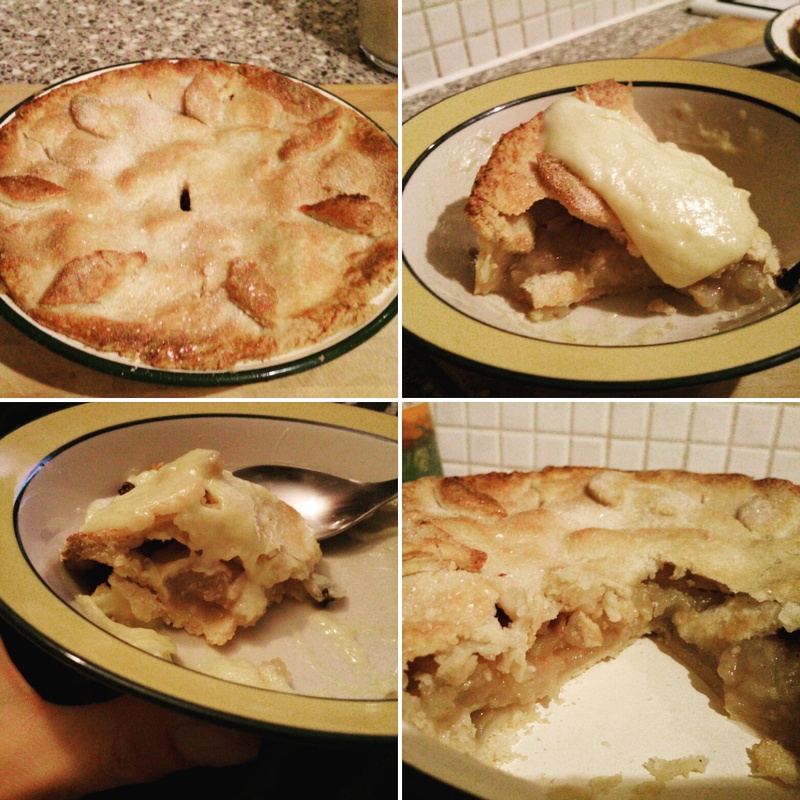 Thankfully success was achieved and the result was this delicious apple pie which we ate accompanied by some yummy homemade custard. Thankfully it also met all Mr B’s expectations, so much so that he has already suggested getting some more apples so that we there can be a repeat of this bake as soon as possible. 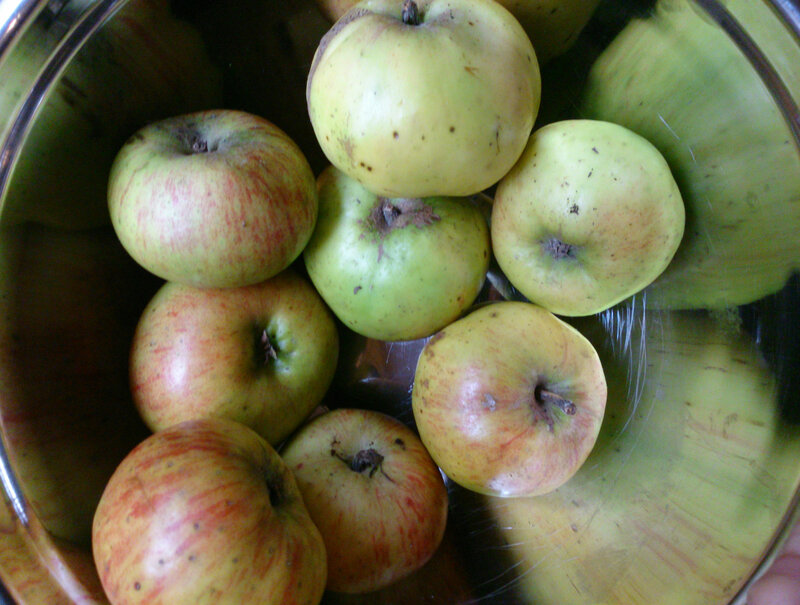 I loved it too, it was a delight to use these delicious apple’s ripened by the sunshine of summer to create a pudding which is so satisfyingly comforting, perfect for a dreary autumnal evening. 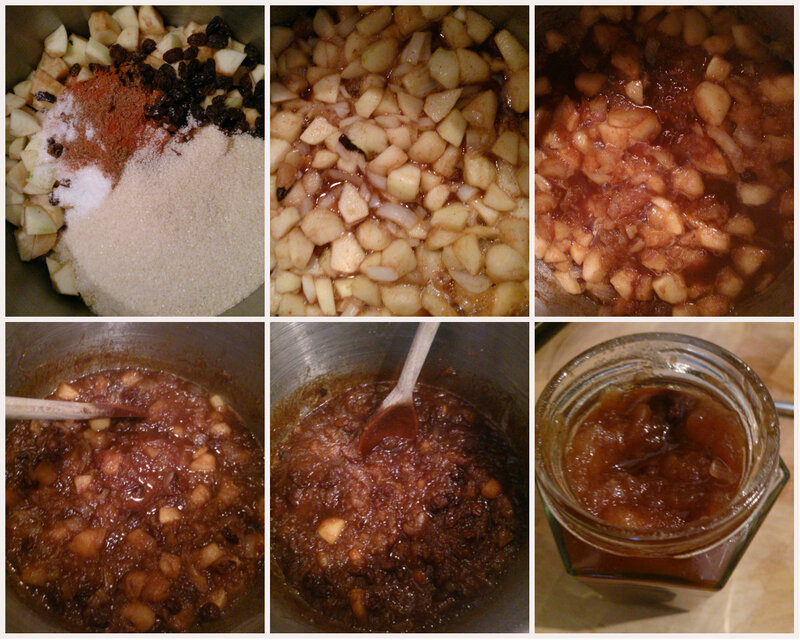 Next on the agenda for the apples which were left was preservation, in the form of some spiced apple chutney. As a self-confessed homebody I have ventured into the realms of preserves before and so for this make I returned to a tried and tested recipe from bbc food (find it here). What I love about preserving is that it captures flavours from seasons already passed in a jar of intense yumminess. I also love that in creating a delicious jam or chutney that time needs to be set aside and patience is needed for a perfect outcome. 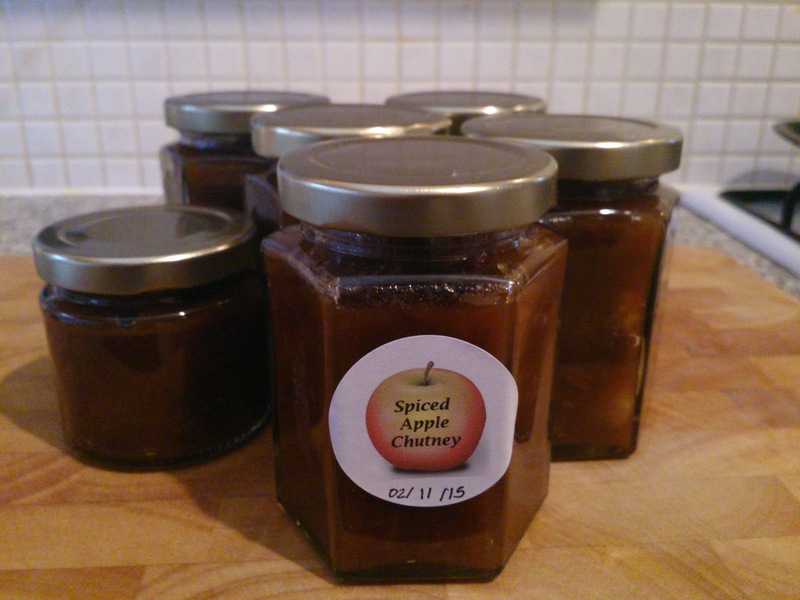 A morning or afternoon in the kitchen can provide jars of goodness to last until the summer suns returns. 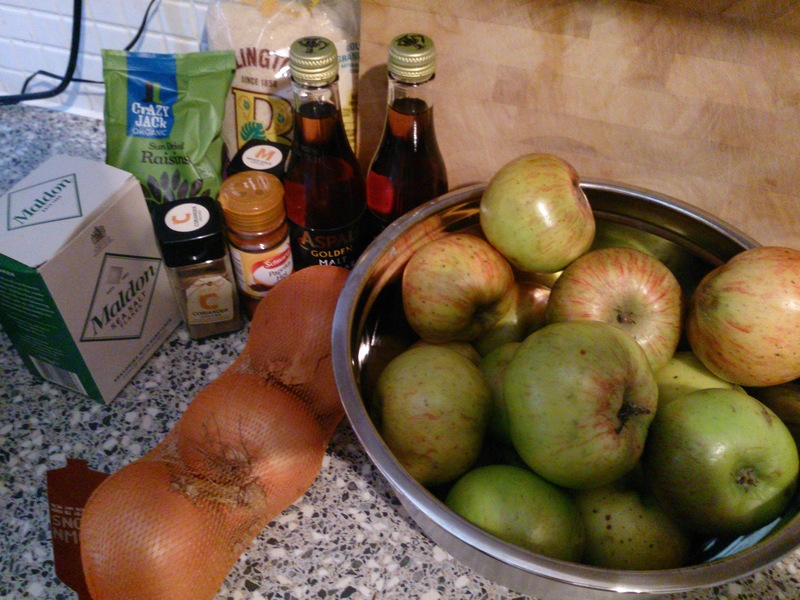 With at least half a dozen apples left and the offer of more if needed, I am sure there will be more sweet delights being created this weekend, perhaps this time it’ll be my favourite pud – apple crumble. October saw the launch of a fabulous new linky co-hosted by myself and the wonderful Mrs B (of Mrs Bishops Bakes and Banter fame) in which we encourage our fellow bloggers to share their #WonderfulWeekends and what good times they have been having. 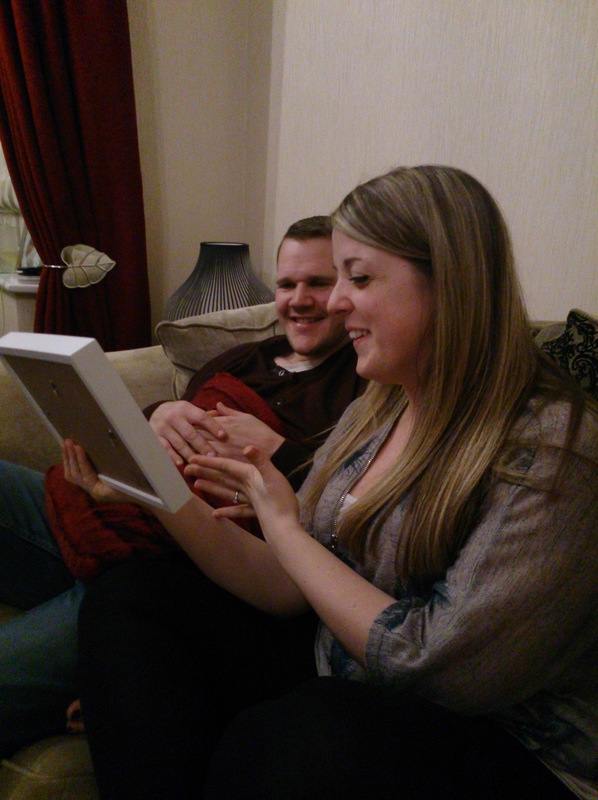 It has been a joy to read all about the adventures and generally joyous times people have been having sharing good times with friends and families. Whether people travelled miles to make their weekend wonderful or stayed a bit closer to home everyone has definitely made the most of their precious time in their own way. 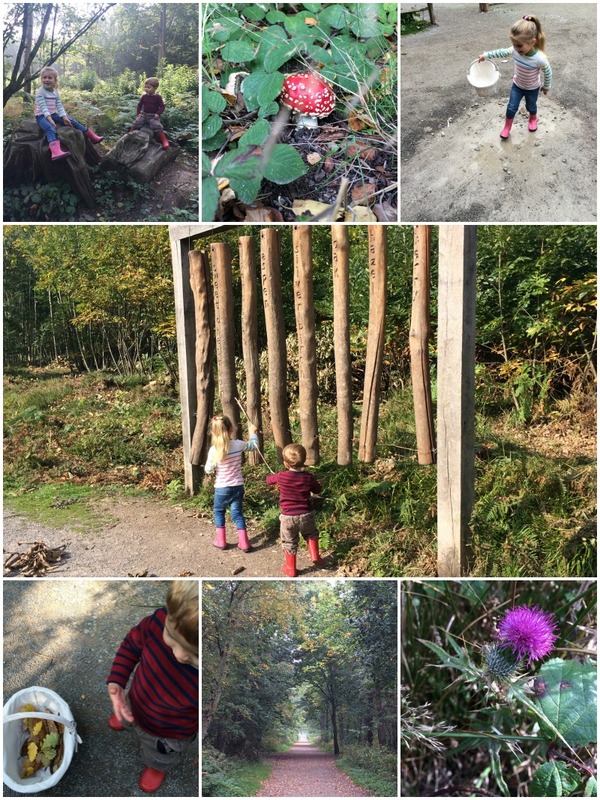 As a nature lover and generally outdoorsy type person, I loved reading all about the woodland adventure the lovely Kara at Innocent Charms Chat had with her family, collecting acorns, jumping in puddles and exploring the wondrous totem poles, tipees and natural musical instruments found on their trail. It was also lovely to see a video clip of their day in the woods as well as these beautiful pictures, this certainly seemed like a super Saturday to me. More family fun was had by Vicki (from Honest Mum) and her boys who spent their weekends escaping to the city travelling to London, Cambridge, York and Liverpool during the month. Their weekends looked full of fun as they visited amazing museums, went to the theatre, ate delicious food and met up with friends. 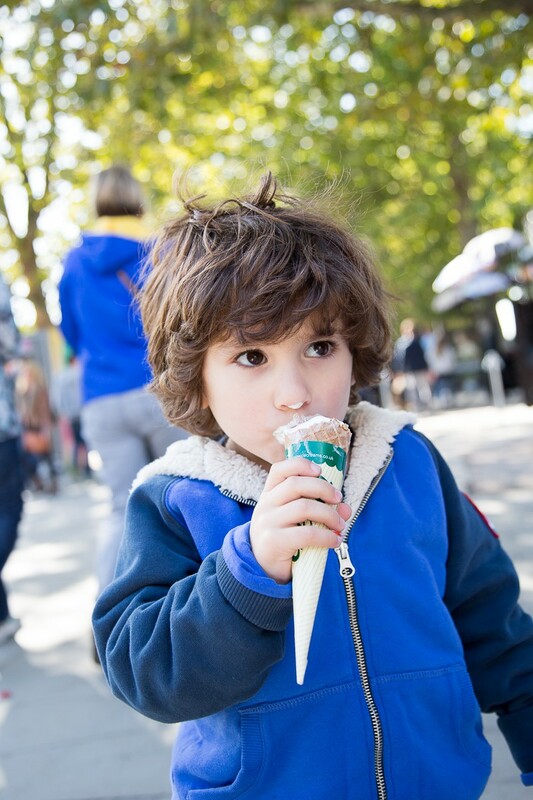 As usual Vicki’s pictures captured these moments wonderfully, I really loved this one of her youngest enjoying an ice cream on a sunny day in London, I have to say am super jealous of his Sherpa Hoodie (I wonder if they do them in adult sizes). 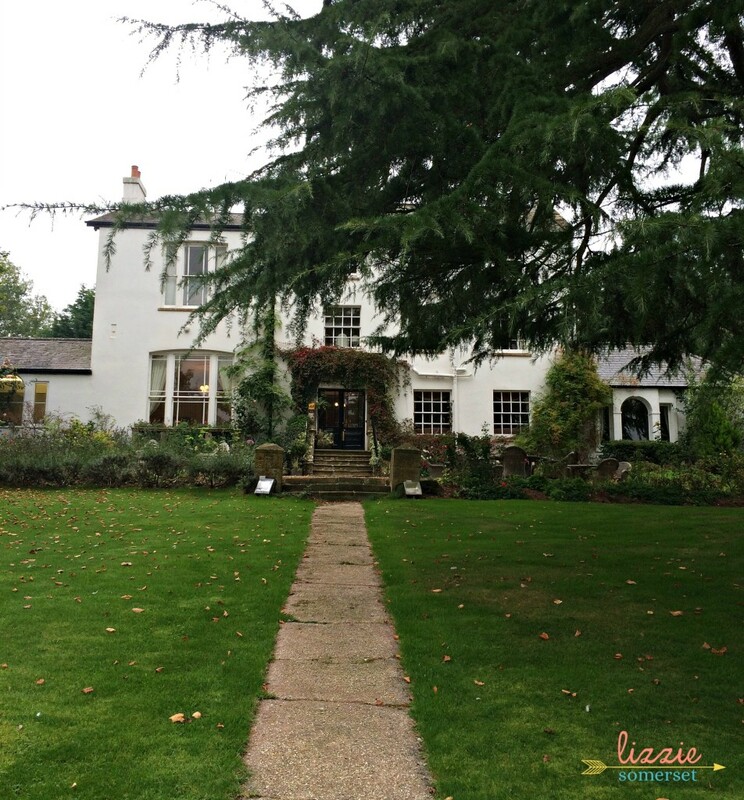 As an October bride I loved reading all about Lizzie Somerset’s anniversary celebrations with her lovely hubby at the beautiful Little Barwick House in Somerset (read all about it here). Taking time to enjoy each others company and chilling out together is exactly how Mr B and I spent our anniversary weekend and like Lizzie’s it was a perfect way to celebrate. Sharon from Elephant and Mangoes certainly brought some sunshine to our linky with her post all the way from beautiful Malaysia as she spent the day picnicing on the beach at Port Dickson with her husband. 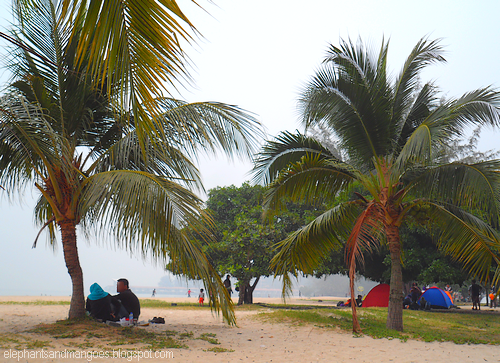 Sitting under a coconut tree chatting and people watching sounds like a perfect way to spend a lazy Sunday. I have felt so inspired by all the posts that were posted this month – to take adventures when they are offered; to explore my local area more; to spend quality time with all the good people in my life and remember that every weekend can be wonderful if you want it to be. 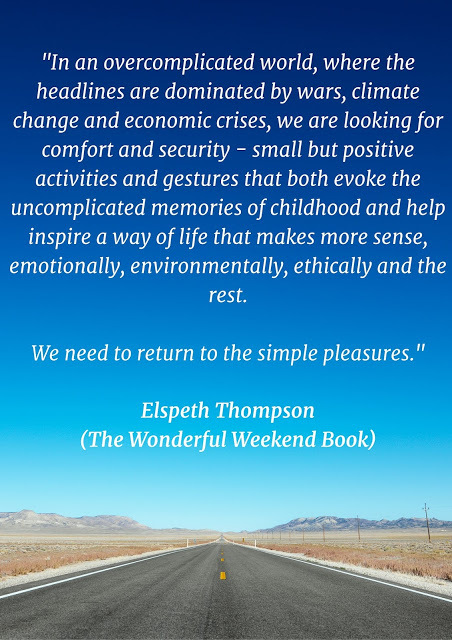 I can’t wait to read the book that inspired it all, The Wonderful Weekend Book by Elspeth Thompson, as recommended by Mrs Bishop herself, it’s definitely on my Christmas list. Thank you so much for all of you who took part, reading through these wonderful posts has certainly brightened my month and I can’t wait to see what wonderfulness November’s linky brings.